"Right now the key thing that is driving higher gas prices is actually the world's oil markets and uncertainty about what's going on in Iran and the Middle East, and that's adding a $20 or $30 premium to oil prices," President Obama said March 23. It's complete and utter nonsense. Oil is trading in lockstep with expectations for economic growth, as reflected in stock prices. There's not a shred of evidence that geopolitical uncertainty has added a penny to the oil price. Obama's $20 to $30 per barrel risk premium is a number pulled out of a hat, without a shred of empirical support. In effect, the President is blaming Israel for high oil prices. One might argue that the market should price strategic risk into the oil price, but the fact is that markets are not especially good at assigning prices to possible events whose probability can't be measured. 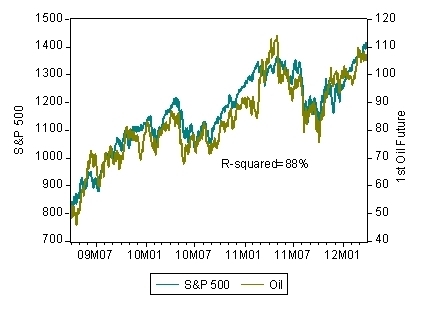 During the past three years, oil prices have tracked equity prices almost perfectly, with a regression coefficient of nearly 90%. (For statisticians, the correlation of daily percentage changes in the two markets is 51%). 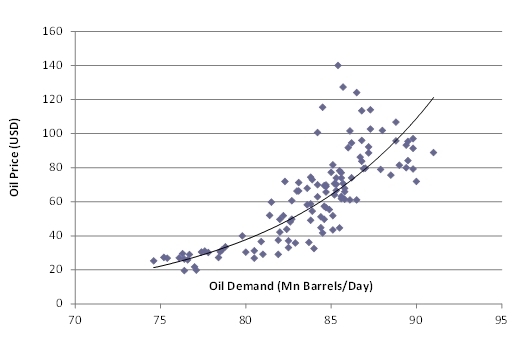 Equity prices embody expectations of future economic growth, and higher growth means more demand for oil. If oil supply cannot keep up with demand—because the Obama administration has restricted development, among other factors—the oil price goes up. There are even stronger grounds to reject Obama's unsubstantiated, self-serving claims about a supposed risk premium in the oil price. Oil price risk is traded every day, in the form of options on the oil price. A hedger or speculator can buy the right to purchase oil at a fixed price over a specified time period. The price of oil options expresses the market's perception of risk of a big move in the cost of oil. 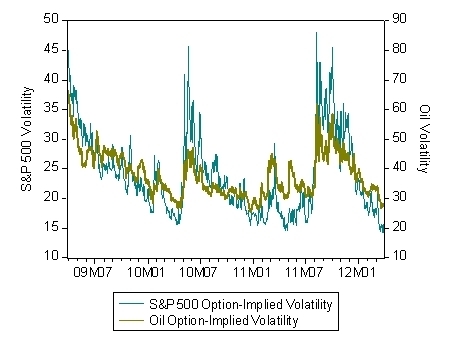 Traders express option prices in terms of "implied volatility," that is, the probability of a big move—the more likely the price is to move, the costlier the option. An implied volatility of 20% for a 12-month option, for example, means the market assigns a probability of about two-thirds that the price will move by 20% in either direction. The cost of hedging against changes in the oil price tracks the cost of hedging the S&P 500 just as closely as oil prices track stock prices. What's more, the cost of hedging against an oil price spike is trading at a three-year low. The problem is not risk, but supply. When demand increases, we observe in Chart 3, prices trend to rise faster than demand, because supply is relative inelastic (it can't quickly expand to meet additional consumption). The only way to reduce gas prices is to drill for more oil. Another thing that should be factored in is the declining value of the dollar due to the Fed expanding the money supply. That also partly explains the rise in equity, since equity expands with inflation, while cash does not. Numerous other commidities have been inflating as well, such as food, gold, and other metals. A valid measure that should be used is to track the price of oil in ounces of gold per barrel. That will factor out currency inflation, and show us the real price movement. The only things not inflating are manufacturing and housing, because that is the only sector with real overcapacity now. Yes, increasing oil supplies would suppress some of the price volatility in both stock markets and oil markets. But the increased supplies must be publicly visible and undeniable. In other words, top level speculation -- where both supply and demand can be manipulated -- must be crushed by a huge weight of visible supply and spare capacity. Otherwise, manipulation is too profitable in a prolonged economic slowdown as a substitute for genuinely productive economic activity. You have to be well heeled to play the game of "shear the rubes" in the oil markets. Sometimes you need to be a sovereign oilco or oil fund, or at that level of financial clout. But if you play the game right, you can even swing presidential elections in rival nations to your benefit. Stock market volatility incorporates political risk premiums just as oil markets do. The markets correlate on many levels -- they are auto-correlated. It will take more work to tease them apart, than the charts pictured above. Indeed, oil prices are a reflection of limited supply, and it's nice to read such a clear presentation. Indeed, Obama does seem to be towing the dubious line that tensions in the Middle East is causing it. However, I do not see Obama's restrictive policies on North American oil production as the exclusive cause of the price increases. Even maximally drill-friendly policies cannot address the problem. Global oil production is in terminal decline, and no amount of drilling worldwide can change this. It's my guess that the "uncertainty" talk is used to mask the fact that oil is in terminal decline, to keep the stock market from tanking.